Measurements: 3.2 x 5.25 inches; or 80 x 134 millimeters. .
Back of card: Solid purple field. In center, round silver disc, surrounded by 14 golden five pointed stars. Can be inverted. Booklet included: Yes, in both English & Spanish. Publisher: Llewellyn. Printed in USA. Comments: There is often a rawness, an obviousness to the magic of west Africa & Haiti, etc., but it's nowhere to be seen in this deck. If you know what the formulas are, if you have the key, these cards will speak to you, otherwise not. Suits are Air, Earth, Mermaids & Fire, which represent the usual ones. Suits range from 1-10. There are no court cards per se. There are, instead, for each suit an Element card, a Message card and a card representing the element of the suit, eg, Dwarves & Gnomes (earth), Salamanders (fire), Fairies & Sylphs (air), and Undines & Mermaids (water). The major arkana number 25. 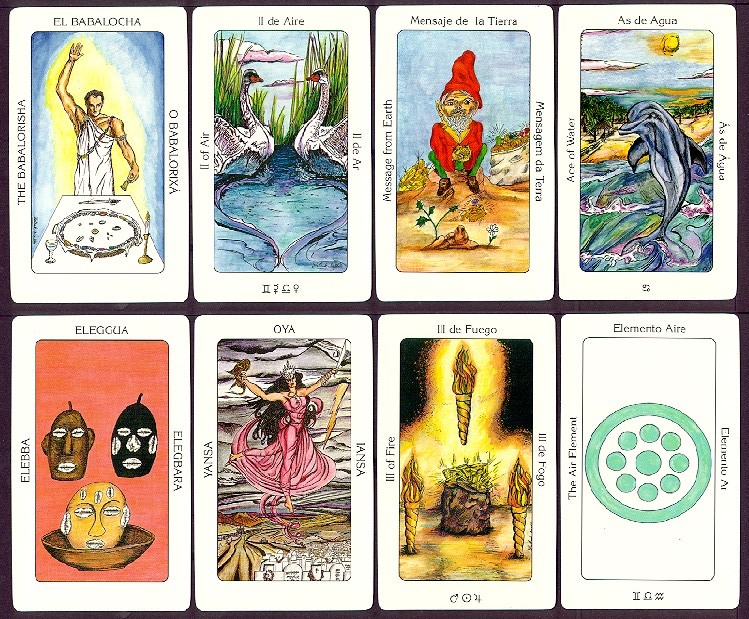 Some of them have the same general nature of traditional tarot, most do not. So four suits of 13 cards each (52), plus 25 major cards, total 77 cards, one card shy of the typical tarot deck.